I needed to center a video the other day and had to re-figure out how I did it last time. So, I figure I should put it here for my reference and for yours. Since the HTML tab lets you put in HTML coding in your Order Forms, the coding (HTML Tag) you need to use to center an iFrame video is simply <center> <iFrame content goes here> </center>. Using the center HTML tag will allow you to make anything stay centered on the page in the section that you are working. I think it works great at the top and the bottom of the Order form. As an example, take a look at the Order form for SuperFoodBox. I centered the video at the top of the page using the <center> HTML coding. 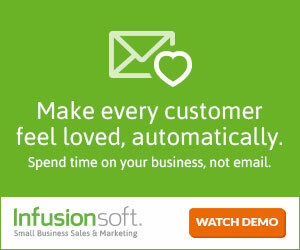 If you didn’t know you could put videos on your custom Infusionsoft Order forms, then now you know you can do that too! For other tips besides how to center a video, please check out the Infusionsoft Tips tab.